Dr. Daniel Bausch Knows The Ebola Virus All Too Well : Goats and Soda Can you catch it from sweat on a cab seat? Will blood transfusions help? Who really wants to go to Africa and pitch in? Is it too late? 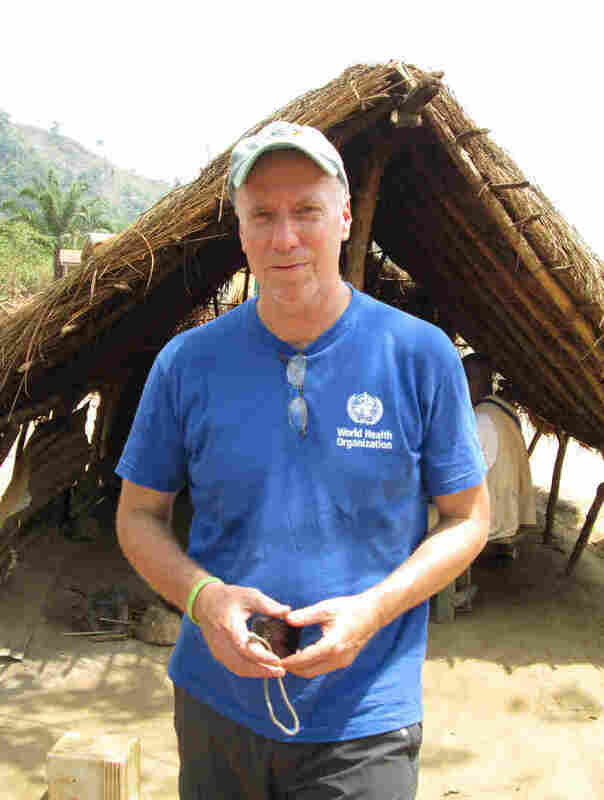 A leading virologist answers burning questions about Ebola. 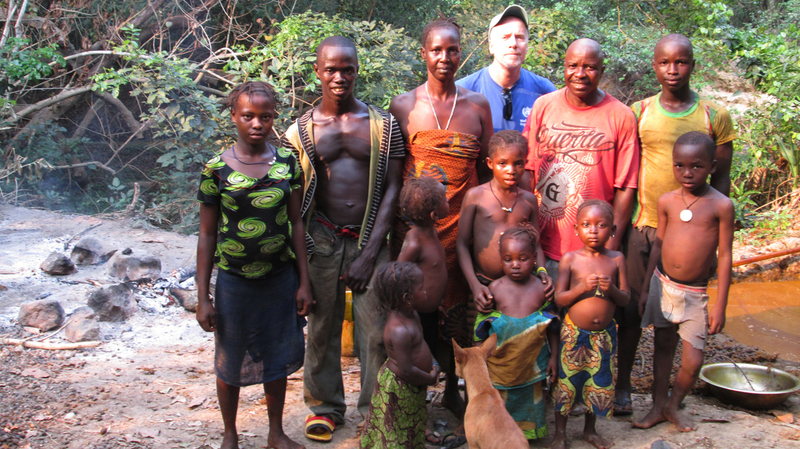 Dr. Daniel Bausch (in blue T-shirt) has spent years studying Ebola. In April, he went to Guinea, where the current outbreak began. The Ebola crisis in West Africa has been a "very personal outbreak for me," says Dr. Daniel Bausch. The virologist spent "quite a few years" working on hemorrhagic fevers at the Centers for Disease Control and Prevention: Ebola as well as Marburg and Lassa fever. He knows the Ebola virus all too well, and he knows many of the people who've been deeply involved in fighting the current outbreak, including Dr. Sheik Umar Khan, a virologist in Sierra Leone who contracted Ebola himself and died this spring. So it has been a challenging year for Bausch, an associate professor at the Tulane School of Public Health and Tropical Medicine. This spring, he spent time in Guinea, where the current outbreak started, and he was in Sierra Leone for most of June and into July. This week he heads to the Centers for Disease Control and Prevention in Georgia to train clinicians heading to West Africa. In Washington, D.C., last week for a round of meetings, Bausch visited NPR's headquarters and fielded questions from our reporters for 90 minutes. "As you can tell," he said wryly, "I talk about this a lot." His answers touched on the essence of the virus, the search for treatments, the dilemmas facing medical caregivers — he once found himself one of two doctors looking after a ward of some 60 Ebola patients — and the Obama plan, which presents its own set of challenges. Finding volunteers to go to West Africa will not be easy, he notes. But without such an effort, he stresses, the only scenario is the worst-case scenario. His comments were simply extraordinary, answering many of the burning questions about the disease with a very human touch. For those who want to dive in, here is his lengthy, freewheeling and fascinating conversation. The comments were condensed (just barely) and edited (very lightly) for clarity. Virologist Dr. Daniel Bausch says the current outbreak of Ebola is "like one of these nightmares where you say, 'I dreamt that all these people that I work with [on] Ebola were getting sick.' "
Is transfusing blood from an Ebola survivor a possible treatment? Wouldn't the blood need to be screened for many other diseases prevalent in West Africa, like Lassa fever? And we hear from Doctors Without Borders that there aren't enough staff just to put regular old IVs in patients to hydrate them. That's a good question and perhaps a controversial one as well. First of all, on the science side, the jury is still out about convalescent plasma or convalescent blood. It has, at least on the surface, an appealing element about it. It's low-tech: We take your blood, check it for a few things that people are used to checking for in that [part of the world], like hepatitis B and C and HIV and some of the other bloodborne pathogens. So far, various people have been treated with convalescent blood. And some have survived, some of them have not. There's really no conclusion that can be drawn from that. On the best-case scenario, if you can ensure that blood is safe, it's probably not going to hurt you very much. And you'll get what we call the colloid — the proteins — and things that come with a unit of blood, probably a reasonable therapy for [an Ebola patient]. It's not going to make a life-and-death difference, but it's probably a good thing. The biggest challenge in this whole affair is the personnel to do things. If you look at Liberia, throughout the civil war, the medical school was closed. Since the civil war [it] has graduated something like an average of 10 medical doctors a year; probably half of them, I'll speculate, are drawn off by the brain drain and working outside the country. So I was happy to see the announcement by Obama. But it's true that when you say we're going to train 500 people a week, who are those 500 people, right? In-country it's very hard, because there's just very few trained health care workers to begin with. And then, of course, they've been decimated by infections and deaths in Liberia and Sierra Leone. I was in Sierra Leone last month trying to recruit health care workers to work in a ward. And they know, of course, that you're recruiting them because their predecessors died of Ebola? So how easy is it to get more health care workers involved? And, of course, the money's not there. No one works for free, especially for a dangerous job. And so we need to get the money flowing, we need to get the right training for those people. But it's not like there's 500 workers [in Sierra Leone]. You probably could name all the nurses in the country and it might not get to 500. And then the internationals, it's not that easy either. First of all, it's kind of just human nature, right, whether you're a doctor or a nurse. Who wants to go to West Africa and treat people with Ebola? There's 90 percent that are going to say, "No, I think I'm OK at home. Fine, thanks very much." And then the 10 percent who say, "I might want to do that," their wife or husband's not real excited about that, or their job's not real excited about it. Who's going to cover you at the hospital for the next month when you're away? But it's the right thing to do to try to find these people, both nationally and internationally, and that's what we have to do. Also, this is not a sprint, it's a marathon; this [outbreak] is going to last many more months. I'm of the very firm conviction that I don't think the resources will be there for the long-term for outside countries to keep involvement. Ultimately, we need an African solution and we need to transfer that capacity to them. That's not an easy thing, but we have to start. How are health care workers being recruited? I don't really know their recruitment process, although I get a fair amount of inquiries almost daily from health care workers saying, "OK, I'm interested." That's not the process, fortunately, but I get people. Some of them are people that I know, and that's worked out. And like I got an email from someone today who I used to work with, and she said, "I'm on my way to Liberia." [Or] someone hears me on NPR radio and then finds my email and writes me, and strangers that say, "How can I get involved?" We've not yet gotten to the point where we understand how that whole thing comes together as some unified response. That's been slow in coming and just difficult to do. What happens if someone wants to get involved? Where is that person directed? So you want to volunteer is what you're saying? It depends upon what you want to do. And different groups have different criteria. So MSF [Doctors Without Borders], for example, I think you have to give at least two months — it might have been six weeks, I don't remember exactly, or you had to have previous experience with viral hemorrhagic fever outbreaks, which makes sense. It's not rocket science — it's not that it's anything particularly difficult conceptually to do. Obviously, though, you have to do it right or it can be dangerous. And then many of the people have never been to sub-Saharan Africa. It's a different place. If you like hot showers, it's maybe not the place for you. Is there a clearinghouse for volunteers? There's not one single clearinghouse that I know of. So you can contact CDC and you can contact MSF. One of the groups that I work with is the American Society of Tropical Medicine and Hygiene; they would love that I'm mentioning them to you. And one of the things that we're putting on our website is all these possible places. So you can click and try to get involved. I had some tense moments when I was in [Guinea] a couple of months ago ... in villages where we were trying to do contact tracing. And people [were] picking up sticks and rocks and things, and blocking the road with logs. You've spent a lot of time in Guinea. Do you have any insights into the anger and suspicion that apparently prevails in southern Guinea, where a team of health workers and journalists were attacked and killed? I worked [there] for many years. And I had some tense moments when I was in that area a couple of months ago, actually, in villages where we were trying to do contact tracing. People picking up sticks and rocks and things, and blocking the road with logs. Did they fear you were bringing in the disease? I think there's numerous rumors. One is exactly as you said, that we're bringing in the disease, or that the disease doesn't exist at all and this is just an excuse, basically, to control populations, to get more research dollars. One of the common [rumors] is we're harvesting organs. And you can see a little bit of the idea. When you have a disease that has a high case fatality, the people go into a treatment center isolation ward, most people don't come out alive. So people attribute causality to that. They say, "Whatever you do, don't go in there, because if you go in there you're going to die." If [someone who's sick wants] to disappear, they'll disappear and we have no way of finding them. Those rumors are not unique to Guinea. They're in all the places and are one of the fundamental problems. Because if you look at our approach to this, it wholly rests upon collaboration with the community. And so we have an outbreak of Ebola, we try to find all the people who are sick, get them isolated and hope we give them the best treatment we can, get all their contacts, go find those people. But people [may not] want to be recognized when they're sick, or don't want to be recognized as being a contact [from someone with Ebola]. And be it an actual jungle in a rural area or an urban jungle, if they want to disappear, they'll disappear and we have no way of finding them. But I think we also have to be careful not to be too judgmental. I'm not an anthropologist or historian, but I've spent a lot of time in sub-Saharan Africa, and the way I look at that is that the colonial-era in sub-Saharan Africa is only about 50 years old versus, for example, in Latin America. I was laughing one time in Peru [where Dr. Bausch lives]; they have these chess sets [with] the indigenous versus the conquistadors. You wouldn't see something like that in sub-Saharan Africa. It's old enough in Latin America that that can pass. But it's only been 50 years that the colonial era ended in sub-Saharan Africa, and for centuries before that, people who looked like me came and said, "Oh, this or that is going on, and it's in your best interest that I'm here to tell you to do this or that." And most often that was probably not the truth. And then the colonial era ended and [those countries] passed over to governments that have largely been very weak and often extremely corrupt. And now we show up and say there's this thing that's Ebola. It's not really illogical that people would say, "I'm not so sure we should believe these people." How do health care workers, who we're told are incredibly proficient at their job, end up getting infected with Ebola? Is there something going on that we don't completely understand? That idea has come up, and people say, well, is this virus different? Is this virus [in West Africa] more communicable than other Ebola viruses? And there was a paper that came out a couple weeks ago that looked at the mutations that have happened in this virus. And there are some mutations, although that in itself is not a drastic thing; you would expect some mutations. It's an RNA virus where mutations are the norm. And it's not drastically different from what we can see in the sequences from other Ebola viruses. So I don't really think that this [infection rate for health workers] is so much of a biological phenomenon. Kenema [in Sierra Leone] has been really the most severe spot, right, where we've had lots of health care worker infections. When I was in Kenema for three or four weeks, I think there were probably 10 or 11 health care workers [who became infected]. Every day someone was getting sick with a fever. And you're trying to turn this around and [recruit] people and train people and encourage people and say, "OK, you can go and you can do this safely." And every day somebody else has a fever, and [then] they're gone, right? A lot of focus has been placed on the PPE — the personal protective equipment — you know, the masks and gloves and gowns, and things like that. But it's overly simplistic to say those don't work, or the virus is different. If you go into that situation in Kenema, once a few health care workers get sick, you get into this really negative cycle. So you're working in a ward, somebody gets sick, dies. The next day, not many people [come to] work. And then it gets into a negative cycle where the ward gets even more unsafe. Because a safe ward, it's not only about masks and gowns and gloves, it's about having the right proportion of health care workers to the patients, it's about having sanitation workers. You go into a ward, it's not unusual to see that someone has fallen out of bed or in delirium has crawled out of bed. They can be on the floor soiled with stool or vomitus or blood. And what should happen is that a team of three or four or five different people, all with the sanitation officer who has some bleach to spray, comes over, carefully decontaminates that area, carefully gets this patient back into a bed. But when I was in Kenema last month, myself and one other doctor sponsored by WHO, we got gowned up to go in and do our rounds. And unbeknownst to us, the nurses had gone on strike. We go in, there's about 60 patients with Ebola in the ward, [and] he and I are the two health care workers that are there. The analogy I've been using, it's like saying, well, you've trained somebody to be a pilot. So there's the plane, go fly the plane, without thinking: What about mechanics? What about the other people who have to guide the plane down the runway? You don't have all the very important supporting personnel that you need for [Ebola], and so it's been a tragic situation. And there was a day when I was in Kenema last month where I thought we just need to close this [hospital]; it's just not ethical to keep doing this with health care workers getting infected. And there was a day when I was in Kenema last month where I thought we just need to close this [hospital]; it's just not ethical to keep doing this with health care workers getting infected. But what do you do? You have 60 people who have Ebola. What do you do with them? Do you say, "Go back to your home"? If you send them all home, that's infecting five more people in each household. So you try to get things as safe as you can [in the hospital] and soldier on. What we've been doing now is ratcheting down the idea of what care really means, not because we want to but because we have to. Many, not all, but many of the places right now, if you get sick with Ebola, it's not at all the care that we want to give, where a doctor examines you and says, "OK, you need some IV fluids" and things like that. We just don't have the capacity. Right now it's to give people a bed, hopefully some food and some water and some analgesics — some Tylenol — for pain, and some oral re-hydration solution, and to get them out of circulation so they don't infect more people. And is that the way we want it to be? Of course not. How do you assess your own risk when you are one of two doctors caring for 60 patients? I felt bad no matter what I did in that situation, because each patient, I would sort of assess. And sometimes I would give in to the doctor side of me saying, well, this person needs an IV, let me try to quickly start an IV on this person and hang some fluids. And then afterward I think that was stupid, right, not because I think that that in itself was dangerous. I was telling somebody earlier, I'm not a person who actually likes risk per se; I don't go skydiving or bungee cord jumping or stuff like that. I'm relatively mild-mannered in my interests. So it's not that I couldn't do that with one patient, but you just realize the futility of it. Let's say, OK, I put an IV in this person and I got a liter of fluid into him, but they need 10 liters a day for the next five days, and even if I wanted to, I'd have to stay in the ward 24 hours a day [to do that], and that just wouldn't be physically possible. So something that has no benefit isn't worth any risk, right? And so if I did it, I would think that was probably not a wise thing to do, and if I didn't do it, you know, if you're a doctor, it feels bad, right? So it wasn't a pleasant situation. If you were treating Ebola patients in this country with our facilities and expertise, what do you think the survival rate would be? Higher, but I don't know what number. These patients are losing an inordinate amount of fluids through vomiting, through diarrhea, through high fevers where you lose fluids, and sometimes through bleeding. And so the ability to give them back those fluids, it would make a difference. But I don't think we should be naïve. Ebola is a very bad disease. Before I'd ever seen a case of Ebola, I'd seen some cases of other viral hemorrhagic fever, like Lassa, and so when I went to my first Ebola outbreak, I was like, "Oh, yeah, this is going to be kind of like that." But it's not like that. It's a very bad disease. Ebola happens fast, people suffer a lot, and it has a high case fatality. And so I think we could bring the case fatality rate down with modern medicine and fluids and all; not even talking about [experimental drugs like] Zmapp, but just with early treatment. But I don't think we should be naïve. It's not going to be something where we get [the fatality rate] down to a few percentage points; it's still going to be a very serious disease. But I don't think we should be naïve. It's not going to be something where we get it down to a few percentage points; it's still going to be a very serious disease. I remember this one patient, not in this outbreak but an outbreak in Uganda a few years ago. And we did have control of that ward and we were doing a little bit closer to kind of what we would think of as typical medical rounds, examining each patient, and able to gear our care to their needs each day to some degree. And this guy came in, he was a military guy, and his wife had just died of confirmed Ebola, and he came in right away saying, "I have a fever." A young, healthy guy. I thought, OK, like, here's a guy, I know he's going to have the disease, I got him right at the beginning, and I have time now because the outbreak is somewhat controlled, and I'm really going to just really pay close attention to this guy and his fluid balance, and see if we can get him through. I don't claim to be the world's best doctor, but I don't think I'm the world's worst either. But he still died. So I think we could definitely get [the death rate] down. I think that supportive care would make a big difference, but it wouldn't obviate the need to have some medicines, if we can get a good medicine and assure that it's safe and effective. What else might play a role in a patient's chances of surviving? Why does one person die and another person survive? We don't really know the answer. Genetic predisposition is one thing. Or the route of inoculation — whether you rub [the virus] into your eye or you eat it. Are you exposed to a thousand virions versus 10 virions. Whether you have other comorbidities, like malaria. Lots of different things [might affect survival]. So we don't really know. And one of the factors is the care that they get. So I don't know. What would we get [the death rate] down to? Would we take the normal case fatality for Ebola Zaire virus from the 60-70 percent range down to 20 percent? That seems a little bit ambitious to me, but we'd definitely knock it down a bit. Do you have any sense that airborne transmission may be possible for Ebola? No, I don't think airborne transmission is going on. From all the data we have from other outbreaks, and as best as we can surmise from this outbreak, people who get Ebola had direct contact with other people who had Ebola. What exactly does direct contact mean? Direct contact means contact with the bodily fluids of someone who is sick with Ebola, and relatively close in time to when that fluid was shed. So this is not a particularly hardy virus in the environment, and this is not something that's getting into the water supply or sitting on the streets or on the grass for days and days and still viable. And so if you look who gets this virus, again, we know who the groups are. [One group is] the people who are health care workers taking care of patients. And there's so much virus now that [the patient] may not be in an Ebola ward. One of the doctors that just died in Sierra Leone a few days ago, she wasn't working in a ward with Ebola, she was working in the public hospital, Connaught Hospital, in Freetown. And the guy who was medevaced back here [to Nebraska] was an obstetrician who was delivering babies and seeing people, but he wasn't working in [an Ebola] ward. Unfortunately, the disease has spread around that you don't know who has Ebola. And so someone comes and they're a pregnant woman with a fever and maybe has a spontaneous abortion. The [clinicians] don't think about Ebola. So it's really direct contact, either a health care worker, a family member taking care of someone who's sick or someone attending a funeral and having direct contact with the corpse or bodily fluids shed from that corpse. And at funerals in Africa, people touch and hug the corpse. There's some places where people wash the corpse and collect the water, and then bathe in the water. But it's not an easily transmitted disease; it's something that has to have that direct contact. Airborne transmission, you know, that's come up in the last few days, especially with [Dr. Michael] Osterholm talking about the mutations. I can't think of any example of mutations that have fundamentally changed the biology of a pathogen so it's transmitted through a different mechanism than would be its norm. Let's put it this way: I can't think of any example of mutations that have fundamentally changed the biology of a [virus] so it's transmitted through a different mechanism than would be its norm, and so there are mutations that would make something a little bit more transmissible or less transmissible, but not necessarily changing its complete mode of transmission. So I don't think that there's airborne transmission of this virus, not in terms of the true aerosolized virus sense. There's airborne transmission if I'm sick and I cough and there are small droplets that might land on your mucus membranes because you're within range; that's a different sort of thing, and that's what the protections and the PPE are designed to prevent. In terms of true airborne transmission, I don't think there is true aerosol transmission, and I'm not worried about mutations conferring it. Is there potential for transmission in public transit, if someone with Ebola were to shed blood or sweat and another passenger came in contact with the blood or sweat? So is there the potential? What often happens is people come with scenarios that are, say, like this. So you're in a taxi and they say, well, what if the person who was in the taxi before me was a sick person who was bleeding or had vomiting, and then [the taxi driver] dropped them off at the hospital. And the passenger had contaminated the seats with vomitus or stool. And then I get into the taxi and I put my hand on the seat, and then I touch my eye. Could I get Ebola like that? Yes, you could get Ebola like that. Is that really what our major concern is? Those things are probably very [rare]. How much do we in fact know about transmission? We don't really have lots of sound data of what period people start shedding virus and from what tissues. And so that would be incredibly valuable data. What we do have is the epidemiological data, and when we put that together from past outbreaks, it really appears that most infections occur from very sick people late in the course of their illness. One thing that happens, and it's very clear from both human as well as nonhuman primate data, that in Ebola, the sicker you are, the higher your viremia — the level of virus in your blood. Conversely, if you're not very sick, you have a very low level of virus in your blood, you're not particularly infectious. If I had Ebola right now — a fever and a headache — but still feel well enough to have this conversation, your risk of getting Ebola from being around me is extremely low to nil, because I just don't have very much virus. And when you think about it, the virus, it's not jumping off the wall, it has to get from one person to another. And so if I have Ebola right now, which I don't, by the way — I haven't been in West Africa for over a month, but if I had Ebola right now, even if I said, "OK, I have a fever and a headache, but I still feel well enough to have this conversation," your risk of getting Ebola from being around me and probably even shaking my hand, is extremely low to nil, because I just don't have very much virus. It's clearly not transmitted from casual contacts. Going and shaking hands with a person who's not sick does not transmit Ebola. And then someone will ask: Well, what if they had a sick family member at home and they didn't wash their hands? So you can always come up with something where you say, "Yeah, that could do that." And the example I use is, OK, there's a plane that's flying overhead, and could that plane crash now into this building and kill us? It could, but it's probably not the most likely thing we need to worry about. So we know how this is spread. This is spread from direct contact with sick people, and that's where we need to focus. And is there somebody somewhere who had indirect contact through one of those things, from being in the wrong taxi or kind of the wrong situation? It probably happens and we don't know it, but it doesn't happen very often, and it's not where we need to focus our public health approach. Is it possible for a family member to be a safe caregiver if the family member has information about how to care for a loved one and maybe even has some resources, but no medical training? I think it's possible to be a safer caregiver. But since we have health care workers who have a good amount of training and have been trained to use the PPE and to take care of a patient with Ebola, and they still get sick, then how could we expect people who are not health care workers to do this safely? So I don't think that we can. I don't think that we can say, "Oh, yeah, sure, if we just give PPE to all the people in the houses, and where there's a sick person that they'll be fine," that's not a realistic expectation. But right now, it's not an either/or. We have no capacity to put enough beds with trained health care workers across Liberia and Sierra Leone in any real short-term sort of framework of the coming few weeks. Now, there's no other choice. People are going to be sick at home, there's no place to go, there's not enough beds in Ebola treatment units across the region right now. And so since they're going to be sick at home and since we have no place to tell them to go, is it better for their family to have some gloves and some bleach and some gowns? I think it's better. Will it mean that there will be no transmission in the household? No, I don't think it will. But could it mean that instead of five people getting infected, three people got infected? It might. And so I think that's worth a try. We can kill the virus pretty easily through bleach and Lysol and alcohol, and a host of different things. And so once it gets out in the environment, it's not particularly hardy. How long can the virus exist outside a human host? The viruses can only replicate in living tissue; they commandeer certain proteins and functions of a living cell for their replication. So once any organism dies, there can be no more replication of a virus. Bacterium is different, right? If you leave the food out, bacteria will grow. But a virus can't do that. And so in this virus, Ebola virus, it's not kind of an Andromeda strain-type thing where we can't kill the virus; we can kill the virus pretty easily through bleach and Lysol and alcohol, and a host of different things. And so once it gets out in the environment, it's not particularly hardy. You can't give an exact number of hours or days because there's not been a lot of research; we need more research, and it also depends upon the conditions. Viruses don't like heat and light, and that will inactivate what they call a lipid membrane of this virus. And so if that virus is out in an area where there's a lot of heat and light, then it's going to be inactivated relatively soon. If that virus is in a place where it's dark and cool, it'll last longer. You can't put a test tube of Ebola virus into the reservoir, the drinking water, and that sort of thing, or spread it around just in the environment and in the ground. Somebody wrote me last week and said, "Do you know where the burial grounds are for patients with Ebola, because we want to try to clean all those areas up because the decaying corpses are going to leak into the water supply." And I wrote back and tried to diplomatically say this is a waste of time because in a decaying corpse, the pH changes, and other things happen, that's not going to be a very conducive environment [for spread]. Again, there can be no replication, so once an organism dies, that's the highest level of virus that can be there. Then it's going to fall off relatively rapidly. And we don't really need to concern ourselves about virus leaking into the water supply and into the groundwater and things; that's not our problem. Is contact tracing a solution to this? Has this outbreak gone beyond the point where tracing individuals who may have had contact with an infected person can help identify possible cases and slow down the spread? Guinea is certainly not under control, but it's under more control than [Liberia and Sierra Leone]. So in Guinea, I think you could still have hope that you can recognize the transmission chain, and if you can feel like you have all the contacts, then contact tracing, if you have the personnel and capacity to trace them, it's still a viable response. Liberia, of course, is the place where we have lots of virus sprinkled around almost the whole country. And the eastern part of Sierra Leone is like that. We fear that the rest of Sierra Leone is going in that direction. I hope not, but the fear is that Sierra Leone is a few weeks away from that sort of logarithmic growth we've seen in Liberia. So one person infects four, and those infect another four, and then those infect another four. And so at a certain point it goes up, and then when it takes off it really goes up. If you have a situation where there's thousands of cases of Ebola that represent thousands of different contacts that are spread over a whole country, and you've really lost sight now of what those transmission chains are, it really does no particular good now. If we know that I'm the only person in the room who has Ebola, and you're my only contact, that makes sense [to do contact tracing]. But now if we say that there's five or six of us in the room who have Ebola and a whole bunch of different contacts, really what's the sense now of kind of tracing those people? Or if we take a larger scale of this whole building, that there's 60 or 70 people that have a whole bunch of chains of transmission, then at a certain point we just have to say everyone in that building's at risk, right? And so we take a different approach. So I don't think [contact tracing is] an approach that we can right now think of doing in Liberia. And, you know, in some areas of Sierra Leone, it probably still makes sense, and other areas not. If contact tracing wouldn't work in Liberia, what's the next option? The idea is we persist with the Ebola treatment units, where [a suspected case] goes in isolation and, ideally, would get IV therapy and medical care. We're not there yet to do that on any sort of scale. Quite frankly, we just don't have the possibility right now of reacting as we wish we could. As we hopefully build capacity and units and beds in Ebola treatment units, then what we would want is the people who are positive would get transferred to get a better level of care. That's going to take time. How could we get ahead of the outbreak? If we had the U.S. making a major intervention in Liberia, the U.K. making a major intervention in Sierra Leone and France making a major intervention in Guinea, that would give us something to work with, to start with. So I'd like to see that. I wouldn't feel comfortable as a public health worker saying that we're just going to give up. Am I optimistic or pessimistic? We don't have many choices right now. And what do you do? Are we going to say, "Well, I guess just wash your hands of it"? I wouldn't feel comfortable as a public health worker saying that we're just going to give up. I do agree that the risk to the United States in terms of sustained transmission or large outbreak here is extremely small, so that's not our No. 1 concern. But the other countries in West Africa are certainly vulnerable. The instability economically [and] politically, that's happening and will happen in the three most afflicted countries and could happen in other places. So there are many reasons to keep on with the fight no matter what. We have to keep doing our best. Is it just with the benefit of hindsight that we can all say mounting the international response is rather late in the day? Doctors Without Borders was saying in April that more personnel and resources were needed on the ground. I view it in a couple different ways. When I went to Guinea, near the beginning of the outbreak, at that time we didn't have cases yet in Sierra Leone and there had been some cases in Liberia. But when I came home from Guinea, I think it was in early May, if you look at the epidemic curve, there was basically this period where we thought we may have had control of things. And I remember having conversations with people at WHO and the team that I was working with, and talking about, well, should we recruit new people to replace me, and maybe it's just going to be a waste because if they're coming, they're going to do clinical care and there's no patients. We thought that maybe things were over at that time. And during that period in Guinea for me, it was kind of, if you will, a typical Ebola outbreak. What I mean by that is that you go into one of these outbreaks and there's the usual players on the field. And so Guinea was sort of a normal Ebola outbreak. And then things turned out to not be under control. When I went back to Sierra Leone a month or six weeks later, and went to the same meeting at Sierra Leone, my first reaction was, "Where is everybody?" We just really had very few people around the table. And I think that was the period where we had outstripped the resources, where people had sent their experts, spent their money for the first two, three months in Guinea and Liberia, and were used to kind of having this very intensive approach, getting people in there, and then three months we usually declare victory. But we outstripped everybody's resources, MSF and everybody else. And then WHO had that meeting to sound the alarm bell, to say this is a big deal and people need to get into this. And I think that some did and some didn't, and there's no denying that collectively we're all late. How can we say anything different? We have this major public health humanitarian disaster unfolding in West Africa, so how hypocritical it would be for me to say, "Yeah, we did everything right." If we did everything right it wouldn't be happening. There's things that should have been different on a lot of different levels. It's all been too slow. I don't like to point fingers. There's things that should have been different on a lot of different levels. It's all been too slow. Sometimes it's been slow because people didn't take it as seriously as they should have. Sometimes it's slow just because it's damn hard to do this, not in terms of it being rocket-science complicated, but you just think: OK, Obama says we're going to get these people into Liberia and do this. And where do you get the 500 people a week? How do you go to a country that is so limited in its resources and its infrastructure and say that you want to set up an isolation center in some remote corner that needs it, but, OK, it's 15 hours by bad road and there's no materials. And oh, by the way, there's no electricity and no running water and stuff. It doesn't just happen because you make an announcement. It takes just an incredible effort to set all this stuff up, and it takes time. Every day I get up and feel frustrated because I'm feeling I want to have some solution. A few months ago, people would say, "What's the solution?" And most times I would think, probably arrogantly, that I have the solution, it's just a matter of getting people to do it. And now it's harder. I haven't given up hope, but there's no doubt that it's an uphill battle. And one of the things that I think still drives me about it all is we still have to try. Even though this is going to be a tough road, we're going to still try our best. And so we still do that now. One of the things that really drives me is this idea of the experimental therapies and vaccines. And working in this field for a good while now, it's frustrating to always say — and it always comes up, you know, you go to whatever country, and the people say, "What about medicines?" And you say, "Oh, well, there's some good medicines and vaccines, but we only know that they work in animals, and it hasn't really gone past that." And it's been awhile that we're saying that. So I feel like one thing that definitely has to happen for the future is that we have to come out of this [outbreak] with some tools. This is our opportunity, it's in the spotlight, there are people willing to bend the rules more than they normally would in terms of the regulatory things we need to do. We don't want to bend them too much — we want to make sure that we're not hurting people. But we can all appreciate that if you had Ebola, you'd be willing to bend the rules yourself a little bit, right? And we can envision that for the future in Ebola, we get one confirmed case of Ebola in Kenema district, Sierra Leone; in two weeks, everybody in Kenema district, Sierra Leone, is vaccinated against Ebola. The people who were unlucky enough to be infected early maybe have a bad disease. But we don't have this big thing. That's where I think we have to get; we have to have something that we come out of this that's good, and this is our opportunity to get that. So that's what I'm kind of focusing on a lot. Is it true that the current outbreak was identified as Ebola because patients were hiccuping, and that's a symptom? That's what was reported in a story in Vanity Fair. Hiccups have been associated with Ebola, but they were really something you saw in terminal cases, at least from my experience. I don't know how many cases of Ebola I've seen, maybe hundreds, 300, 400, something like that. But I had never seen hiccups early on, and I write some textbook chapters about this, and I always write that hiccups are a late sign. Then people told me, "Oh, we're seeing this in people," and I just thought they were wrong. But when I went to West Africa the last couple of times, I saw some people early on who had hiccups. Next time I write that chapter, I'm going to have to change it. So I think it's real. Editor's note: An earlier version of this story included the quote: "I can't think of any example of mutations that have fundamentally changed the biology of a pathogen so it's transmitted through a different mechanism than would be its norm." A reader contacted us to note that Yersinia pestis, which caused the plague, did in fact change its transmission from food-and-water-borne routes to bites from blood-feeding fleas. We have amended the text, inserting "virus" in brackets in place of "pathogen."